I’ve been trying to create a montage of the glorious stone cats of Romsey Abbey, but no matter what I do with it, I can only get half of them into the featured image at the top of the page, so here they are in their full glory. They leave me wondering whether the stone mason(s) working on the Abbey really liked cats, or definitely thought they were creatures of the devil, to have so many gargoyles look feline. I fear the latter, but they are a formidable line up of humourous grotesques… I probably missed some higher up the building. So, what are we doing in Romsey? A and I always promise ourselves Fridays for pleasure: seaside or a walk or a garden if it’s fine, exhibition or historic building if not. We have only been intermittently successful this spring/summer owing to illness, and other more pressing priorities. It was several weeks ago that we managed this trip; I was still not up to a walk, it was blisteringly hot and I was desperate to get out of the house. 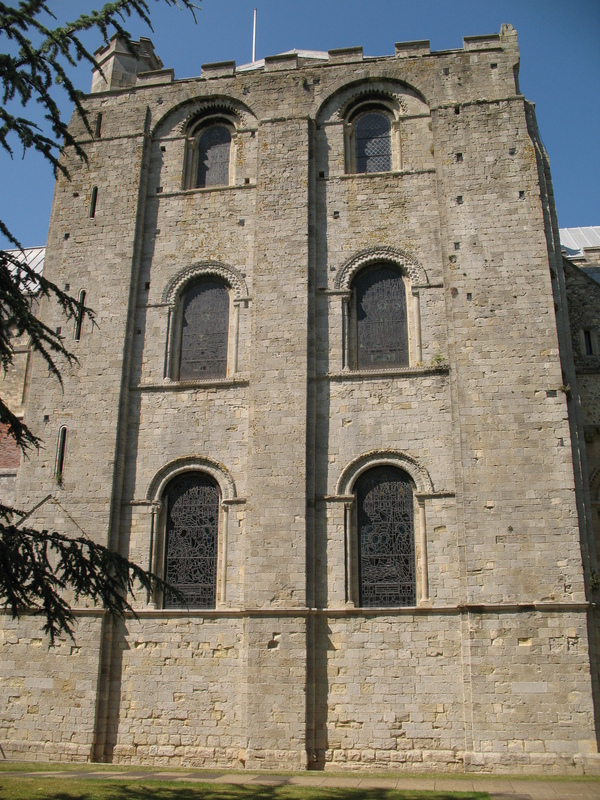 Romsey has been on my list for a while, I’ve always vaguely known that the Abbey was worth a look, and we discovered that A had ancestors there, which gave it further interest in a general sort of way. In terms of a day out, it’s just about at our limit: two hours travel each way just about justified by what’s at the end of the journey. Getting there was surprisingly easy by train and the station is an easy walk from the centre (unlike a lot of places!). We discovered that Romsey is actually rather charming, and like its Abbey, has neither been ruined by neglect nor by over restoration. 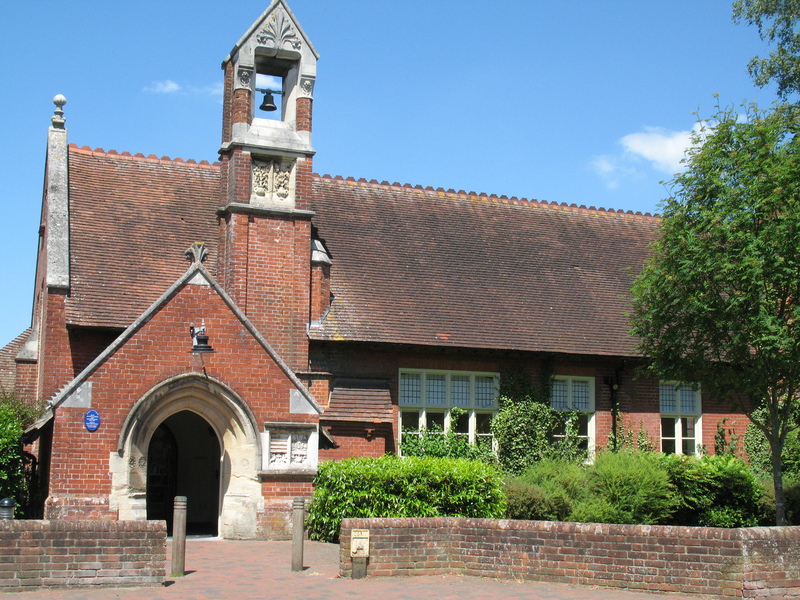 On our way from the station we passed the library, housed in a pleasing red brick Arts & Crafts style building that had once been a school. By the time we were in the centre of the town, I was muttering, “I think I could live here, let’s check the politics of the local council… do yo think these houses have much back garden?” Not that we’re planning on moving, it’s just a litmus test; like the occasional National Trust property we walk into and say, “Throw everyone out, send a carriage for the cats, we’re taking possession.” (Lindisfarne Castle and Hill House, Helensburgh; take a bow). The two main streets are lined with attractive old buildings and the corn exchange has been preserved as a bank. On a sunny late May lunchtime, the streets were peaceful but anything but deserted, with a few market stalls operating, and the inhabitants extraordinarily friendly. We got into conversation in shops, restaurants and on the street with all sorts without any initiative on our part. There is a proper sweet shop, so I got myself a fix of aniseed balls. (I love aniseed sweets. Twist for the sharp swift sugary rush, balls for slow release consideration – plus they always escape into the bottom of my bag and, being pretty much indestructible, can be a happy surprise weeks later). There are a lot of café/ tea shop/ pubs/ restaurants, though none stood out as the-place-to-eat. The place we chose was disappointing in that it looked interesting and wasn’t, the dish I picked with care, for not mentioning cheese, arrived smothered in it; and A’s raspberry juice was actually some kind of cordial and so strong we had to water it down with half my Sicilian lemonade to make it drinkable; my own fault for not asking, and A’s for not complaining, but still, poor selling technique and service on their part. If we went back I’d go for one of the purveyors of sandwiches and baked potatoes. The other thing Romsey has in spades is charity shops, and pretty high quality too. I got a good haul of books and we also found several elements of costume for the opera; and they let us leave our purchases behind the till to pick up on our way home. Probably the oldest building in the town (apart from the Abbey) is known at King John’s Hunting Lodge. That guy must have been a prodigious hunter, his lodges litter the south of the country. Romsey has documentary evidence that there really was a KJHL in the town, but archeology has proved that this isn’t it. Name not withstanding, it’s an interesting building, well interpreted, friendly staff, and it has a knucklebone floor (which I’d always imagined was a term for decorative flint work or something, but no, it’s actual cow knuckle bones ) and medieval graffiti, and satisfying windows that used to be doors, and windows that are now cupboards and so on, and a very pretty garden. The museum next door (included in entry, more charming staff) is fairly typical how-life-used-to-be lived, but has two stand out exhibits, a recording on wax cylinder of local celebrity Florence Nightingale, sounding like Celia Johnson on speed having just been goosed; and a recreation of the hunting and fishing and general hardware shop that used to be here, complete with mannikin of the erstwhile owner which talked if you pinged the brass ‘attention’ bell. The gent in question was an enthusiastic inventor of clever garden gadgets, and we had a whale of a time exploring his ideas, and the drawers of the shop which held everything from cheese graters to fishing flies. and freed will Jan ye 27 1693/4. Now then, what does that mean? A nervous assertor? Discriminating grace? Freed will, as opposed to free will? And why the two year dates? We didn’t move from Julian to Gregorian calendar until Wednesday 2 September 1752 (which was followed by Thursday 14 September 1752) so what’s that about? Was there some issue about when the new year started, like not on the 1st january? Surely by the 27th the year was well and truly launched? Or was the tombstone carved so much later that no one could remember which year he’d died? Bizarre. I get quite a picture of Thomas Warren from those few words, probably completely wrong, but it keeps me amused. Below the inscription are shown their children, a bundle of 4 cheerful, plump, slightly surprised moppets in red. At first glance it looks like 2 girls and 2 boys, but the inscription says 4 sons, and given that their mother was only 22 when she died (the same day as her older husband) the implication is that the two youngest hadn’t yet been ‘breeched’. Be in shares, in Blest Glorie. This brings me back to genealogy and A’s ancient ancestors. This was a bit of a detective work too. 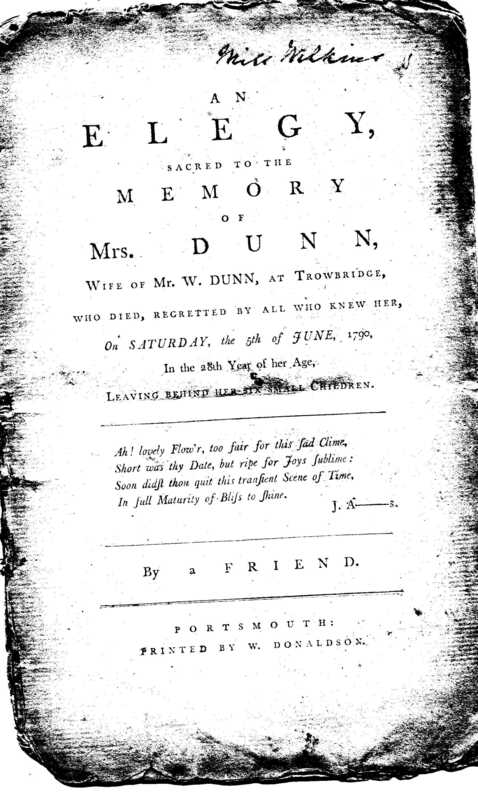 In the ‘broody box’ a metal cash box owned by A’s father, there was among various other family documents a printed Elegy in memory of a Mrs Dunn. This is Dunn the gentlemans outfitter, though not that specific branch of the family, and rather earlier in the family tree. Now, because it only mentions the initial of her husband, and her name not at all, it took a while to work out who she was. The number of children left motherless was a further clue, and we had a death date, and age at death and we assumed she’d died in Trowbridge, Wiltshire. 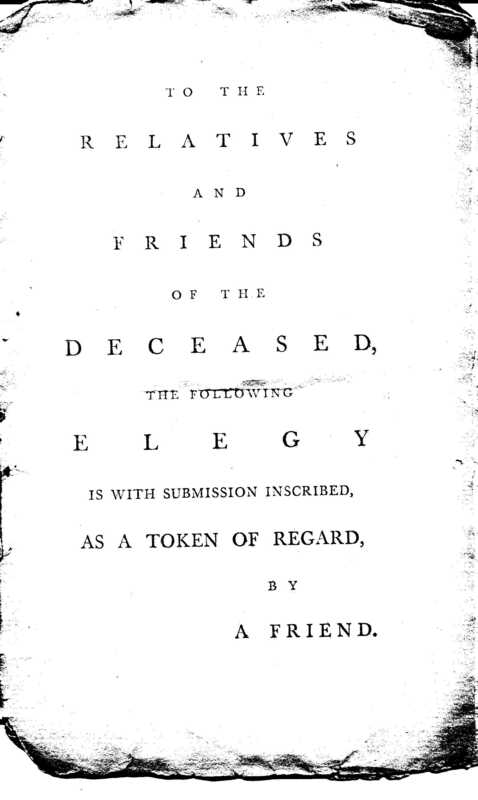 However, the fact that the Elegy was printed in Portsmouth suggested a Hampshire link. A bit of research found her first name to be Elizabeth. So with Witt as a possible maiden name, we checked out births in Trowbridge and couldn’t find her, so we back tracked to the Hampshire connection. We eventually found that Elizabeth Witt was born in 1762 and died in June 1790, that she was the daughter of Stephen Witt who died in Romsey in 1792, and his wife Elizabeth who died in 1804. Our Elizabeth had a younger brother, Robert, born after the family moved to Trowbridge. Another typical find: Elizabeth’s brother Robert married Mary Dunn, one of the cousins of Elizabeth’s husband William. This happens a lot in the Trowbridge woollen merchants of A’s family tree, the best example of this is a Mr John Cooper, marries a Miss Wilkins, and his father, also John Cooper, for his third wife then marries the youngest sister of his son’s wife. That seems a bit over the top to me! But what a great story there is buried in there. Not bad from a document too coy to mention the actual name of the writer or the deceased. So that’s why we were in Romsey. 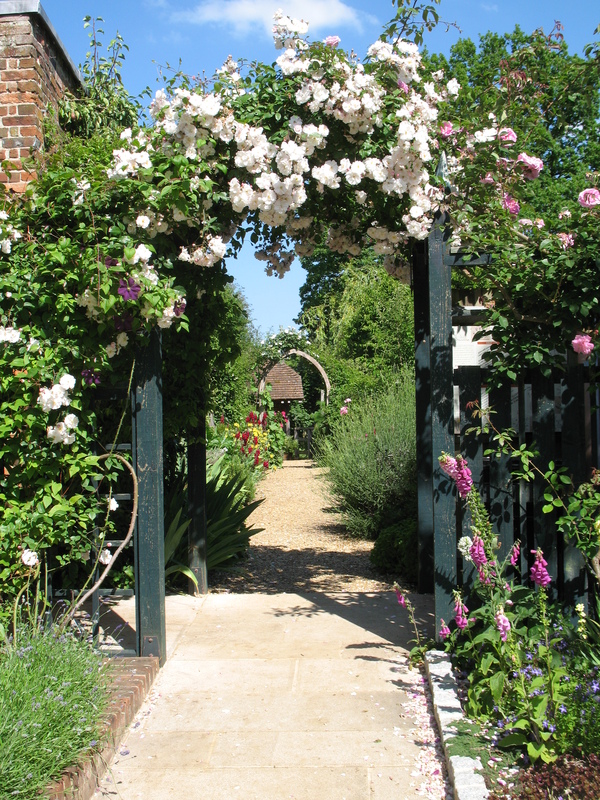 This entry was posted in Days Out, Genealogy, Inspirations and tagged architecture, Cherry Potts, Elizabeth Witt, Genealogy, historic buildings, John Sainte Barbe, near London, Romsey, Romsey Abbey, Tomb stones, Trowbridge by Cherry Potts. Bookmark the permalink. Totally fascinating, Cherry – and a pleasant change from the opera rehearsals! no research was done ages ago, though I was rather hoping one of the tombs in the Abbey would be a Witt, sadly not.